Here is a photo of my sister one week ago. 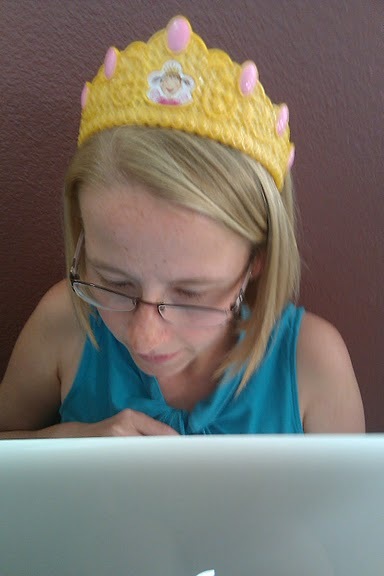 She’s wearing a Pinkalicious crown because she’s a good aunt. She looks worried because she’s looking at the Warrior Dash website. 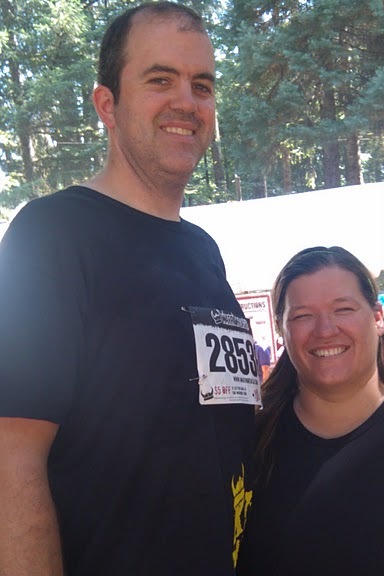 She agreed to do the Warrior Dash with me just about a year ago. Ever notice it’s easy to sign up for crazy things when they are far off in the future? Here is a picture of the friends we trust before the event. He is not really that much taller than her. He’s standing on a very steep hill. I point this out because the entire three-mile course was on a very steep hill. We ran. We climbed walls. 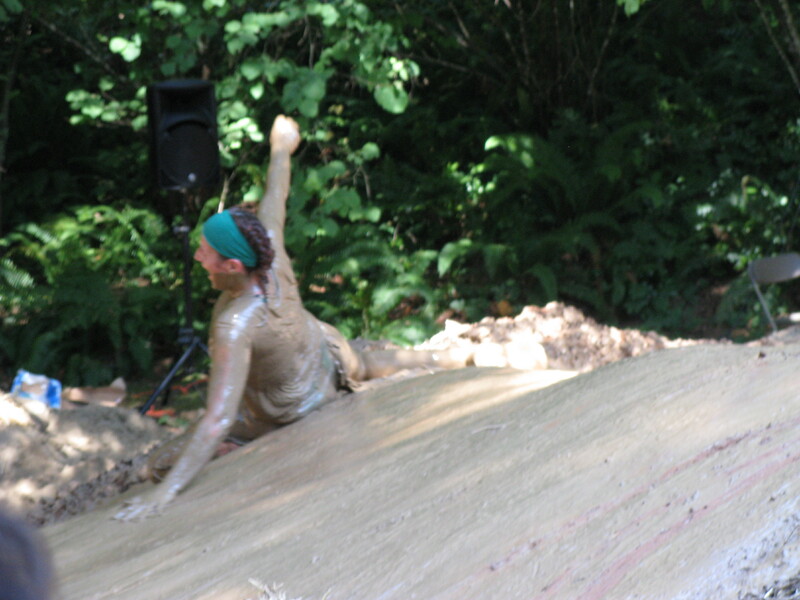 I was unduly proud of myself when I hauled my body up a wall with a rope. Granted the wall had toe holds but still. I have a rope burn on my elbow to prove it. We dodged through tires. We climbed cargo nets. Did I mention we climbed walls ? Five different obstacles involved climbing walls. It stuck with me. I’m still grinning. We crawled under barbed wire. 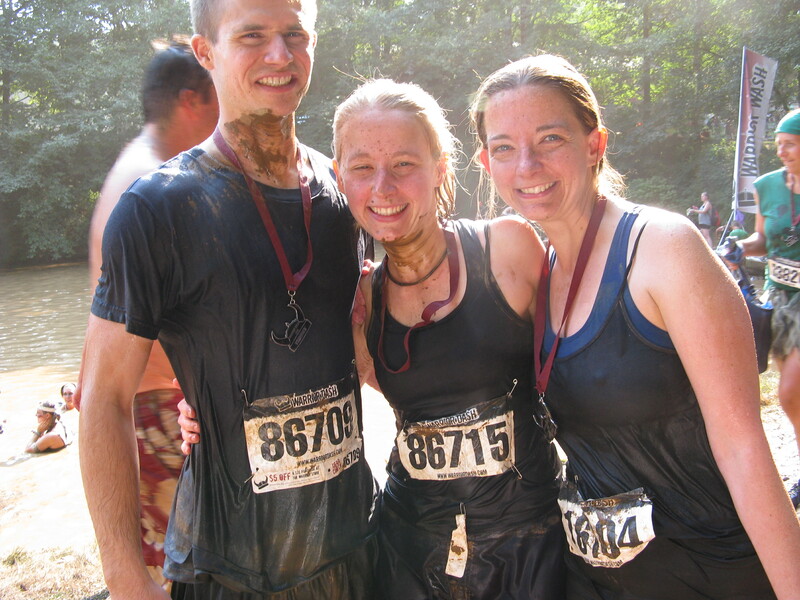 We slid down a mud slide. We jumped over fire pits. This is not me. It could be though. This is us at the finish line. 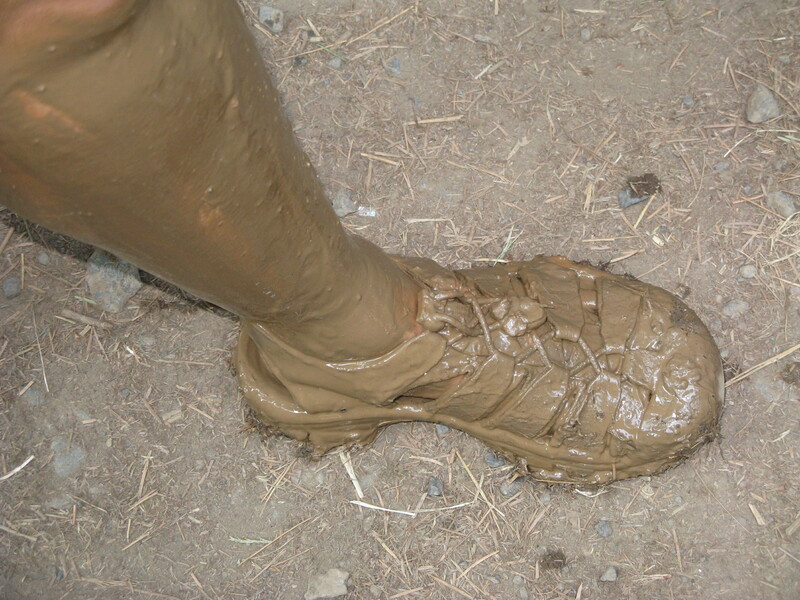 This is my shoe at the finish line. I wore these shoes every day in Rwanda. My kind husband washed them for me and they look great. I love these shoes. This is us after we had a communal bath in the lake to get clean. I still wrapped my car seat in a garbage sack and sat on a towel. On the way home, I downed a bottle of PowerAid and ate the free packet of sunflower seeds. I couldn’t stop grinning. This whole event was fun. I came in 487th out of 601 in my age bracket. I actually climbed up a wall. Did I already mention the wall? 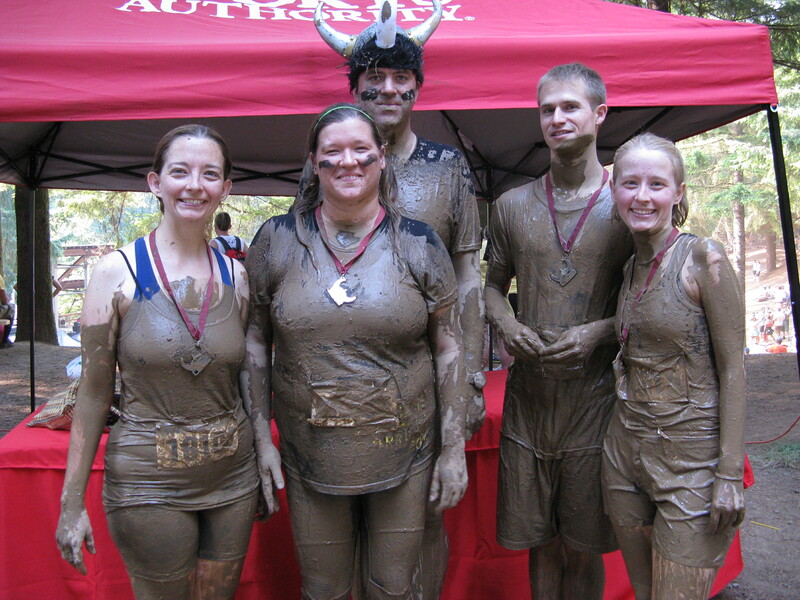 You should sign up for something crazy and silly and challenging. I feel like a Warrior. My house has one very minor drawback. The driveway. It is gravel and a little steep. Okay, that’s not totally true. It’s very steep and there is a curve at the steepest point. This driveway has caused a few hiccups over the past eleven years. It really is not that easy to carry a newborn down this hill in the snow. You have to walk sideways and hold onto the tree branches but it can be done. It is also difficult to deliver pianos. or groceries. But those stories are all not what this blog is about. Thank goodness. At an any rate, my husband and I can both back up this driveway without skidding and it’s not a problem. Over the weekend we had a visitor. We were sitting in our living room boxing up all our earthly possessions when we heard the sound of very large tires on our driveway. I walked outside and sitting there, stopped on the steep curve was a large, black, diesel, jacked up pickup truck. Driving this monster was a kid who had to be twelve. He must have lied on his driver’s license application because I do not believe he was sixteen. He had with him two equally young and slightly dazed girls. He said “Is this house for sale”. I think what he meant was “Is this house empty so me and my girls here can come in and get drunk and cause great damage?” I think this is what he meant because his bumper stickers were quite….expressive and colorful. He then tried to back up the hill. It did not work. I asked if he had four-wheel drive. Nope….broken. Front wheel drive? Nope. I sighed and went and got my car keys. We spent the next little bit maneuvering our cars around so he could pull all the way down. We backed up the hill and waited. and waited. and waited. Him: I can’t turn my truck around. Me: Want me to try? Him: Do you know how to drive stick? (No, that’s not what I said…but it is what I thought). Me: Did you know your tires are bald and your clutch is almost totally blown? 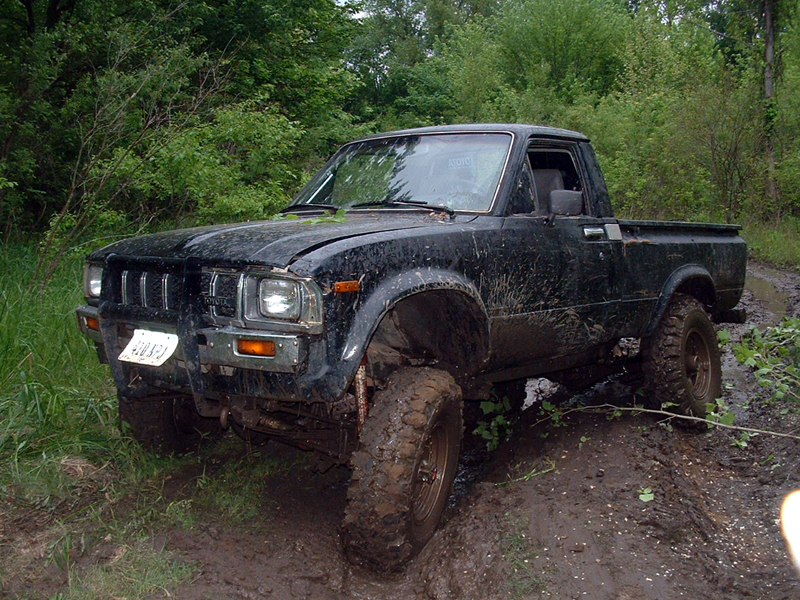 I turned the truck around and just when I got it all the way around and pointed up hill…. Him: I got it from here. Me: I think I’ll try. The side kick girls: You better let her do it. Tee Hee. Oh how glad I am not to be sixteen anymore. This kid is never going to live it down. I hope he learns from it though.